Ivory was used all over Europe for religious works of art. It was often combined with precious metals and usually took the form of relief panels, for book covers, portable altars and caskets. An almost unbroken tradition of ivory carving extends from the Roman and Byzantine empires until the end of the 14th century. From about 1250, Paris became the centre of production for figures and reliefs intended for private devotion. This statuette representing Saint Martin and the Beggar was made in Germany (Cologne or Mainz), in about 1320. The episode represented here is narrated in the 13th-century Golden Legend of Jacobus de Voragine. The scene was translated into visual form by the eleventh century, becoming one of the most common individual images of the Middle Ages. 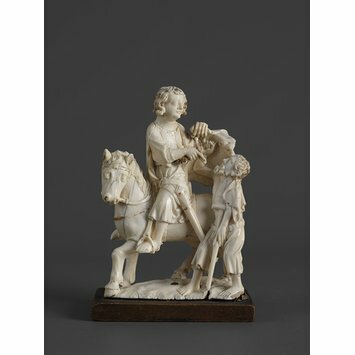 Groups of Saint Martin and the beggar were especially popular in sculpture on a larger scale, and numerous examples survive from the 13th to the 15th centuries. 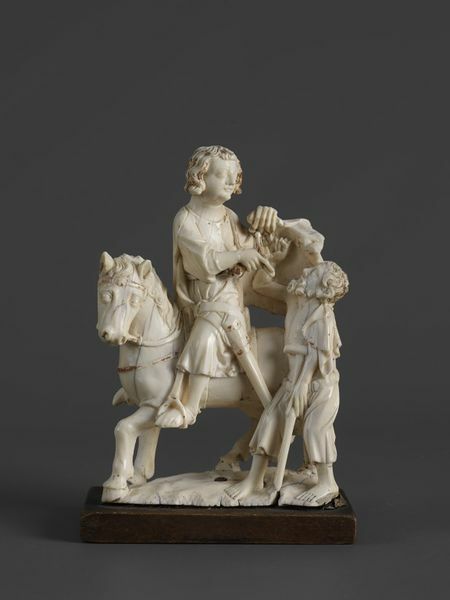 Despite the scene's ubiquity in wood and stone, no other ivory figures of St. Martin and the beggar appear to survive. The style of the ivory points towards a Lower or Middle Rhenish origin. Apart from that, St Martin was the patron saint of Mainz Cathedral, at the heart of the biggest and most powerful archbishopric in the Holy Roman Empire, and it is to be expected that devotional sculptures of the saint would have enjoyed an especially strong local popularity. He was also venerated in Cologne. The young saint is represented on horseback, bare headed, turning in the saddle and in the act of dividing his cloak with his sword in order to share it with the beggar, who stands supporting himself on a crutch with his right arm raised to take the stuff. He is dressed in a long robe, belted and with a scabbard hanging from his waist, his feet in spurs; the saddle, with girth, is shown below him. The beggar wearing only loose trousers, looks up at St Martin and reaches out with his right arm to take the cloak. The sculpture retains considerable traces of gilding and its red ground. Bought with assistance from the National Art-Collections Fund. Purchased through Mallet & Son at Sothby's, London, 29 June 1939 (lot 142, ill.; £440). Tardy. Les Ivoires.Evolution décorative du 1er siècle à nos jours, Paris, 1966, p.85. ill.
Holm, P.M and Berliner, R. Das Hallesch Heisteim, Man. Aschaffent. 14, Berlin, 1931, cat. no. 66b and taf. 13a. Williamson, Paul. 'Gothic Ivories in Detroit and Baltimore' Apollo. CXLV, March 1997, p.49, fig. 3.